(Nanowerk News) Tiny electrical wires protrude from some bacteria and contribute to rock and dirt formation. Researchers studying the protein that makes up one such wire have determined the protein's structure. The finding is important to such diverse fields as producing energy, recycling Earth's carbon and miniaturizing computers. "This is the first atomic resolution structure of this protein from an electrically conductive bacterial species, and it sets the foundation for understanding how these nanowires work," said structural biologist Patrick Reardon of the Department of Energy's Pacific Northwest National Laboratory. Reardon is the 2012 William R. Wiley Distinguished Postdoctoral Fellow at EMSL, the DOE's Environmental Molecular Sciences Laboratory at PNNL. With the help of related structures on disease-causing bacteria, the researchers show that the protein's shape and form suggest possible ways for the bacteria to shuttle electrons along the nanowire. The results were reported in October in the Journal of Biological Chemistry ("Structure of the Type IVa Major Pilin from the Electrically Conductive Bacterial Nanowires of Geobacter sulfurreducens"). Zooming in on the Geobacter-Gonorrhea composite shows how the aromatic residues (teal balloon-like structures) bulge from the surface of pilin proteins (variously colored helical structures) within the fiber. "How to get electrons from the inside of bacteria to the outside is important for many different things, such as bacterial fuel cells, how carbon cycles through the environment and how to make new nanomaterials for applications like biocomputers," said Reardon. Many bacterial species wave fingerlike projections along their bodies. The bacteria use these fingers, called pili, to adhere to surfaces or weave into films or recognize objects in the environment. A group of related bacteria makes these bendy, stretchy structures out of a protein called pilin, and an even smaller group uses these structures like electrical wires. Researchers and engineers would like to take advantage of this wiring. Bacteria produce electrons while respiring and use the wires to run electrons out of their little bacterial bodies. Normally the electrons build up or break down minerals in rock, but the system can also be used to clean up toxic heavy metals or to run a bacterial fuel cell. To better understand how pilins contribute to conduction, Reardon and NMR lead scientist Karl Mueller explored pilin from an electrically conducting bacteria known as Geobacter sulfurreducens. Previous research on Geobacter's pilin — PilA — provided a big hint. PilA required certain spots along its length known as aromatic residues to conduct electricity. Without those aromatic residues where they were, Geobacter had no zip in its pili. 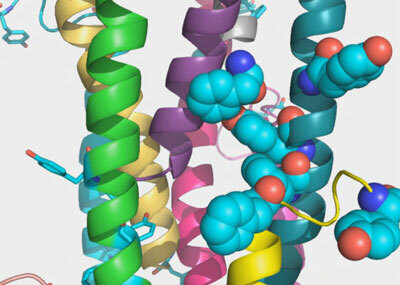 But proteins are like a long string that folds up into a compact three-dimensional shape. Without knowing the shape of pilin, it wasn't clear where the aromatic residues landed in space or how they contributed to electron shuttling. To find out, the researchers used NMR — a technology similar to medical MRIs — at EMSL to picture the shape of PilA. On its own, PilA looks like a long skinny spring, with a slight kink about halfway up. The aromatic residues, which are bulky anyway, bulge along its length. But the protein by itself isn't enough to reveal how conduction works. Many pilin proteins work together to form a fiber, and Reardon and Mueller only had one. Nor did the researchers have the whole fiber to put into the NMR instrument. To get more clues, Reardon borrowed the computer image of an assembled fiber from an unrelated species, the bacteria that cause gonorrhea. Gonorrhea's fiber does not conduct electricity nor does its pilin have as many aromatic residues. But its pilin has a similar shape to PilA, so using a computer program, Reardon overlaid PilA on its Gonorrhea cousins. At this point, the aromatic residues clearly stood out. "We get clusters of aromatic residues, and they wrap along the wire candy cane style," said Reardon. But that just raised another question. If the electrons traveling along Geobacter's pilin are using these aromatic residues, they could be hopping from aromatic island to aromatic island. Alternatively, the aromatic residues could be close enough to pass the electrons through like a baton in a running race. Reardon and Mueller agree the single structure is not enough to choose between the two options. The next step, Mueller said, is to purify the whole fiber from Geobacter microbes and determine the complete structure. The task is technologically challenging however because the fiber has to be grown within the bacteria themselves. Visualizing the whole fiber, though, will show the scientists if the fiber resembles islands in a stream more, or the streambed itself.